Lahore: While the holy month of Ramzan has not yet started, the prices of many food items have already begun to soar, putting immense pressure on the public to purchase even essential food items to meet their dietary needs in the month of blessings. Milk forms an integral part of daily diet and in line with its social responsibility; Haleeb Foods has announced that it is actually reducing the price of its one litre and 250ml packaged milk to facilitate the people in Ramzan. 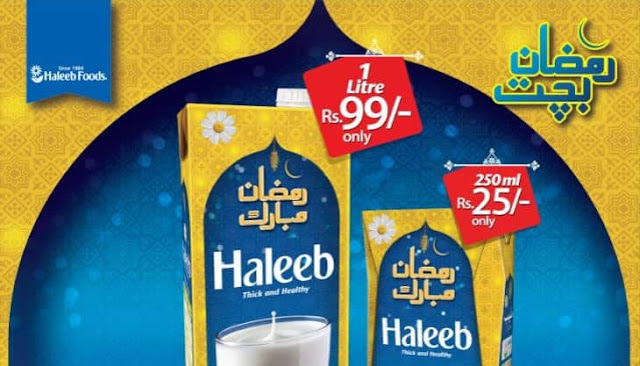 Haleeb believes that it is the consumers’ basic right to get quality product at an affordable price and this need intensifies in Ramzan when people fast all day. The consumption of milk increases considerably in this holy month as people need to give themselves sufficient energy for the whole day’s fasting. Every individual has different dietary needs but milk is one such diet that caters the need of majority of people because it is rich in protein, calcium, iron, phosphorous, vitamin A, and other important healthy ingredients. The nutritional value of milk is beneficial for almost everyone irrespective of age and gender and regular intake of unadulterated milk keeps one healthy and strong, particularly in the month in which people fast for about 16 hours. Haleeb Foods Limited is one of the pioneers of the dairy sector in Pakistan and has been catering the nutritional needs of Pakistani people and it vows to continue to do so by providing quality and unadulterated milk to people.